Warning: this post contains minor spoilers. 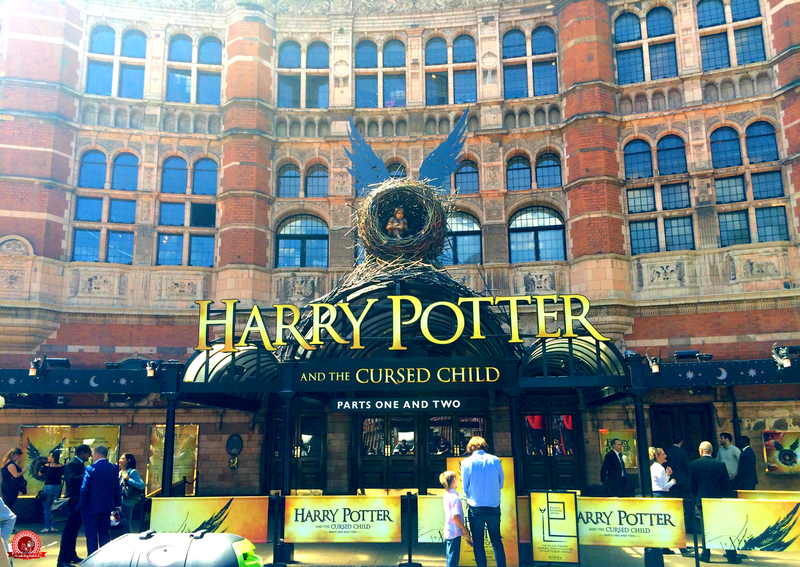 On my birthday last year, tickets went on sale for Harry Potter and the Cursed Child, the eighth story and the brand-new two-part play by J.K. Rowling, Jack Thorne and John Tiffany. In the frenzy that ensued (seriously, if you tried to get tickets that day, you will remember the horrendous virtual queues) I managed to grab tickets to see both parts on 6th July. I mean, if you can't treat yourself on your birthday, when can you? My god, this was a perfect production. Let's start with casting. When the actors were first announced, I didn't have an opinion. No one reads a book in the same way as anyone else; it's completely unique, and we all imagine the characters in different ways. Because of that, even when the cast photos were released, I didn't have an opinion except that racism isn't cool and people need to grow up. I didn't compare the actors with the film cast, either, because this is an entirely different medium and, as much as I love them, Radcliffe, Watson and Grint are irrelevant to the play. It's not like they are the characters just because they played them first; they're actors who were cast in a production, just like Parker, Dumezweni and Thornley. Not having seen any of the actors in anything else before, I waited until the play to form my proper opinion. To me, the casting was spot-on. You know the actors you're watching are special when you're able to forget that you're in a theatre with 1,399 other people and that your legs are cramped because there's literally no leg room. Sam Clemmett (Albus Potter) and Anthony Boyle (Scorpius Malfoy) had such brilliant chemistry, and they both prompted a lot of laughter, as did Paul Thornley (Ron Weasley). It's a fairly dark play in places, but it definitely has more comedy than the films (and possibly the books, too - it's been a while!) Cherrelle Skeete (Rose Granger-Weasley), although we didn't see a lot of her, had the Granger personality nailed. It's not hard to see why Jamie Parker (Harry Potter) landed the lead role; he's completely believable as a man trying and struggling to be a good father with nothing to base it on. His acting was extremely emotive. In addition to that, I love plays where the action is moved away from the stage and into the audience. Highlights include dementors literally flying across the audience from every direction, and creepy writing that magically appears on the ceiling, the walls, and other surfaces at one point in the play. Will you be seeing Harry Potter and the Cursed Child? If you've seen it already, what did you think? Thank you for sharing! I've been fairly indifferent to everything surrounding this cuz I know I'll never see it. It sounds like a lot of heart went into this - and I'm surprised by how funny it is! I was surprised at how funny it was, too! I really want to see it but it's sold out until 2018 or something... Did you see Emma Watson because wasn't she there the same night. I love this review, Thank you!! She was! I didn't see her though, unfortunately. I wonder how she managed to stay undercover in a room full of thousands of Potter fans?? Ahhhh I'm so jealous you have been, I can't wait to go and I'm so happy to hear that it's as amazing on stage as what I had hoped it would be. I believe the script has been leaked, what I've heard so far sounds pretty much ridiuclous. I'm generally just annoyed with J.K. Rowling for not just leaving it be. At this point the whole HP franchise just feels like a desperate attempt to milk the fandom for money. I don't know, I like HP just as much as the next person, but ugh...just let it eeeeeeennnddd. Idk, I probably won't be watching this, I really don't like it when authors milk every last cent out of their readers. But hey, great that you liked it! I agree with everything you said about the production and execution -- I was so impressed! I wonder how you felt about the plot though? I loved everything *except* the story, which I thought was pretty silly (like The Bookavid said). But since it was a play, there was still so much to love in terms of visuals, choreography, sound, lights, etc. Hi Amber, this is an amazing review of the play. I haven't seen it yet and am not really sure when it'll come to Canada but I just can't wait to see it after I read this review on it. I will however, be going to an event this weekend, where they'll be turning one of the bigger streets in the city that I live in into Diagon Alley and have games and contests and for the honor of the book. I will also be picking up a copy while at this event. Just can't wait!! :) Thanks so much for the review!